You are here: Home / Care Plans / Why Consider a Website Care Plan? Why Consider a Website Care Plan? Successful websites continuously attract the right type of visitors and lead them down a path toward becoming a customer. This requires consistent content publishing and monitoring of the website to make sure it is achieving its objectives. It also necessitates routine upkeep to assure that your website operates at peak performance and maximum efficiency. We maintain the homes we live in and the vehicles we drive. You change the filters in your HVAC units every three months and the oil in your car every 5,000 miles. Your smart connected thermostat and car both receive regular software updates to keep them running smoothly and effectively. You wouldn't even consider letting these routine maintenance tasks go for any length of time because you know the cost of fixing these essential tools can be budget-breaking. You also embrace the fact that preventive maintenance saves time and money over the long term. What's that old adage? "An ounce of prevention is worth a pound of cure." Having a few safeguards in place before a fire starts is preferable to a lot of fixing up afterward. Nowadays, the odds are about even that your website runs on one of the popular content management systems (CMS). Content management systems are web-based applications for creating and managing the content of a website. W3Techs is dedicated to collecting survey data to provide information about the usage of various types of technologies on the web. Their CMS statistics focus on the top 10 million websites in the world. The following table shows that WordPress is the most popular CMS in the world. As of this writing, it is used on 28.3% of the top 10 million sites, which W3Techs extrapolates to a 59.2% world-wide marketshare. That's BIG! Year over year, WordPress has experienced explosive growth while the use of Drupal and Joomla have remained fairly consistent. Myth Busted: "Set It and Forget It"
Who doesn't remember inventor Ron Popeil and his famous infomercials where he immortalized the phrase "Set It and Forget It" as he marketed his creation, the Ronco Showtime Rotisserie. The Ronco website still proclaims it to be the "#1 Selling Rotisserie in the World!" Well, maybe set it and forget is true for a kitchen appliance, but it is not true for WordPress, the statistically proven #1 CMS in the world. 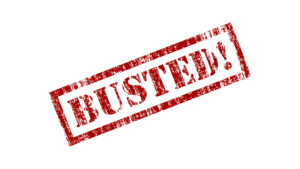 Set It and Forget It for a WordPress powered website is a myth busted to such a high degree that it would make the original MythBusters proud! The WordPress developers maintain a regular release schedule. Major releases are sent out every 6 months. Minor releases are sent out much more frequently, especially when a new bug or security vulnerability is discovered that requires immediate fixing. Bug fixes and security vulnerabilities always leave your site open to compromise. You also have to consider the plugins running on your site. With more than 50,000 plugins in the WordPress plugin repository, not to mention the thousands that are available through 3rd party sources, any number of these are probably providing at least some functionality on your site. Bug fixes and security vulnerabilities in plugins could mean lots of updates required on a regular basis. Your site's performance, load time, downtime, and uptime, are dependent on WordPress and its plugins functioning as they should in their latest versions. The site's growth, fresh content, analytics monitoring, and design changes, are dependent on making sure all site updates are done smoothly and error-free. If you don't keep your website up-to-date, it's very likely costing you a lot more than you realize. Potential customers don't want to sit around waiting for websites to load. If someone visits your website and finds something wrong with it, they'll be out of there in a heartbeat; and you may not even be aware that your site is having a problem. How often do you check your site to make sure it's still working? If you are unaware of issues or downtime, you are losing potential customers. If you're a fan of DIY projects, you've no doubt tackled some of the challenges of maintaining your home or car on your own. At sometime though, you may have started out doing one of those projects and then realized, quite quickly, that you were over your head and needed help from a professional. Maintaining a website on your own can save you a little bit of money in the short term, but can end up costing you more than ever you imagined in the long term. Inexperience or neglecting critical updates can damage the look and functionality of your site. It can leave your site open to hacking attempts or code insertions that can make your site a carrier for viruses or malware. Your site can even be banned from appearing in search engine results. If you just updated your site from the WordPress admin area, you have no record of which updates actually took place. Did you make a backup before the update? Plugin and theme updates are known to go bad at times, bringing a site to a screeching halt. What happens if a problem happens a couple of days or even weeks after an update? Do you have any way of discovering which update caused the problem and how to fix it? At best, it would be difficult to know what changed and how to recover your site without restoring a very old backup. You could possibly end up losing days or weeks of content changes, business records, sales orders, customer contact details, payment information, and the like. Just name it and you can lose it. Nobody knows your business better than you. Wouldn't it be nice to only deal with what you know best and let the professionals handle what we know best? Would you ever go to court and serve as your own attorney? Of course, you wouldn't! So why try to maintain your own website if you’re not a web professional? When you use an experienced web professional to properly update and maintain your site, you are saving potential lost sales, capturing new visitors, and gaining a competitive edge. At Victor Font Consulting Group, LLC, we go to great lengths to care for your site as though it were our very own. Before every update, we first backup the site. After the updates are applied, we check the site for any issues. We provide 24/7/365 uptime monitoring and know within seconds whether your site is suffering from any issues. Our website care software keeps a record of updated plugins so if there is ever an issue, we can tell what plugin version was changed and revert back. Our monthly maintenance report includes performance and security scan details. If in the event we ever catch a plugin issue, we address it before you ever know there’s a problem. If you’re interested in securing a website care contract for your site, contact us to learn how we can keep your site in proper working order. In the meantime, you please take the time to review our care plan options. It's worth the read.